Non-league Kidderminster caused an FA Cup shock by beating League Two Newport County to reach the third round for the first time in five years. Michael Gash fired Harriers ahead from inside the area before Callum Gittings struck from close range. Gittings made it 3-0 before the break with his second after being put through one-on-one with Lenny Pidgeley. Gash also claimed a brace by firing in a well worked free-kick before Robbie Willmott's shot and header made it 4-2. Harriers continued their form of last season against the Pilgrims, when Steve Burr's side beat the Conference Premier play-off winners twice and finished above Justin Edinburgh's side in the table. "We had enough chances early on to get ourselves in front, but goals changes games, and they they were very clinical. "Unfortunately, we weren't. We can do better. The first goal was with the outside of the foot and it's a good goal. The fourth goal is a great strike, and there is not much you can do defence-wise. "Connor [Washington] was manhandled in the wall for the free-kick, but we could do better for the third goal, which won them the game. "I am not going to criticise the players because we have not been overrun or been out of the game. "We let ourselves down and we are despondent because of the result, but we had enough chance to win the game." Match ends, Kidderminster Harriers 4, Newport County 2. Second Half ends, Kidderminster Harriers 4, Newport County 2. Attempt missed. Michael Flynn (Newport County) right footed shot from outside the box is high and wide to the right. Assisted by Robbie Willmott. Attempt missed. Lee Vaughan (Kidderminster Harriers) right footed shot from outside the box misses to the left. Assisted by Marvin Johnson. Dangerous play by Robbie Willmott (Newport County). Lee Fowler (Kidderminster Harriers) wins a free kick in the defensive half. Kyle Storer (Kidderminster Harriers) wins a free kick on the left wing. Jack Byrne (Kidderminster Harriers) wins a free kick on the left wing. Attempt blocked. Michael Flynn (Newport County) right footed shot from outside the box is blocked. Assisted by Andy Sandell. Tom Naylor (Newport County) wins a free kick in the defensive half. Lee Fowler (Kidderminster Harriers) is shown the yellow card. Attempt blocked. Kyle Storer (Kidderminster Harriers) right footed shot from outside the box is blocked. Assisted by Joe Lolley. Goal! 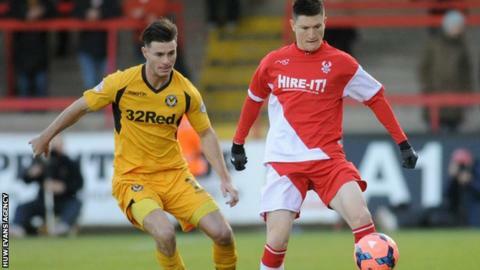 Kidderminster Harriers 4, Newport County 2. Robbie Willmott (Newport County) header from very close range to the bottom right corner. Assisted by Andy Sandell with a cross. Attempt saved. Jack Byrne (Kidderminster Harriers) right footed shot from outside the box is saved in the centre of the goal. Assisted by Marvin Johnson. Goal! Kidderminster Harriers 4, Newport County 1. Robbie Willmott (Newport County) left footed shot from the centre of the box to the top left corner. Attempt missed. Tom Naylor (Newport County) right footed shot from the right side of the box is close, but misses to the right. Attempt blocked. Conor Washington (Newport County) right footed shot from outside the box is blocked. Assisted by Adam Chapman. Attempt blocked. Kyle Storer (Kidderminster Harriers) right footed shot from outside the box is blocked. Assisted by Marvin Johnson. Attempt missed. Andrew Hughes (Newport County) left footed shot from outside the box is too high. Assisted by Michael Flynn. Corner, Kidderminster Harriers. Conceded by Adam Chapman. Attempt blocked. Kyle Storer (Kidderminster Harriers) right footed shot from outside the box is blocked. Michael Gash (Kidderminster Harriers) wins a free kick in the attacking half. Substitution, Kidderminster Harriers. Jack Byrne replaces Callum Gittings. Substitution, Kidderminster Harriers. Marvin Johnson replaces Amari Morgan-Smith. Corner, Newport County. Conceded by Danny Jackman. Attempt missed. Christian Jolley (Newport County) header from the centre of the box misses to the left. Assisted by Conor Washington with a cross. Attempt missed. Christian Jolley (Newport County) right footed shot from outside the box is too high.